How My Time Flies: Just Do It! I'm overtly stealing from Nike here. 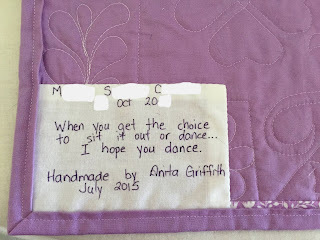 This quilt was a lesson in "stop thinking so much and just do it". I struggled a lot with how to quilt this baby. I don't know why. 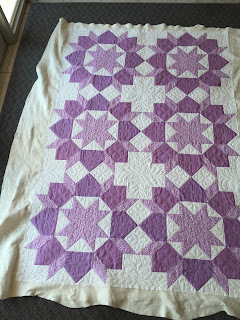 In the end, I'm really happy with my results - I also started reminding myself that this is a gift for a 5 year old - what she is most concerned about is whether there is enough purple - not how great the quilting is. All my fussing was worth it. I took my first foray into feathers and I'm pleased with my results. I want to practice lots more and my confidence has a good foundation. It is actually bound and ready to go. I can't get any photos yet - it's way too hot to be lugging around a quilt. I'll get a few though and post them. ...nothing. The oil is gone or so lightweight that it hasn't left a mark, or the baking soda worked, or it was just water and not oil that dripped. I've breathed a sigh of relief. Now I'm trying to quilt the quilt for my cousin. It's huge and heavy and slow going. Wish me luck. I am SO impressed with your quilting! Fabulous! Thanks! I'm really happy too.